(TibetanReview.net, May14, 2016) – China has raised the political rank and authority of its Tibet Military Command to one level higher than its counterpart provincial-level military commands, placing it under the direct leadership of the PLA Army, reported China’s official globaltimes.cn May 13. 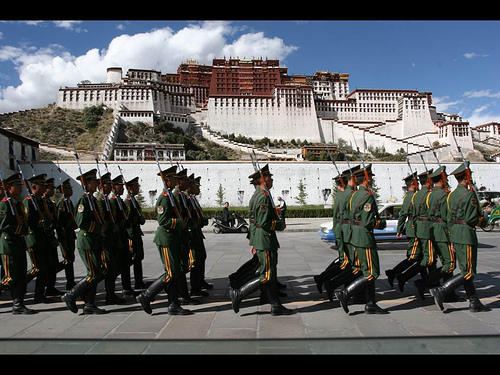 The Tibet Military Command bears great responsibility to prepare for possible conflicts between China and India, and currently it is difficult to secure all the military resources they need, the report cited Song Zhongping, a Beijing-based military expert, as saying. “The elevation of the authority level is not only an improvement for the troops’ designation, but also an expansion of their function and mission,” the report quoted Zhao Zhong, deputy director of the Political Work Department of the Tibet Military Command as saying, citing China Youth Daily, which carried the original report. Before its current elevation, the Tibet Military Command was under the leadership of China’s Western Theater Command, which is headquartered in Chengdu, capital of Sichuan Province. “After the military reform, the Tibet Military Command’s priority is the management of military resources, as well as the region’s national defense mobilization,” Song has said. The report also said the Xinjiang Military Command’s political rank may also be raised in the future. it added that the military commands in Tibet and Xinjiang had always enjoyed special political status in the past and the promotion in rank this time reflected a continuation of China’s policy.